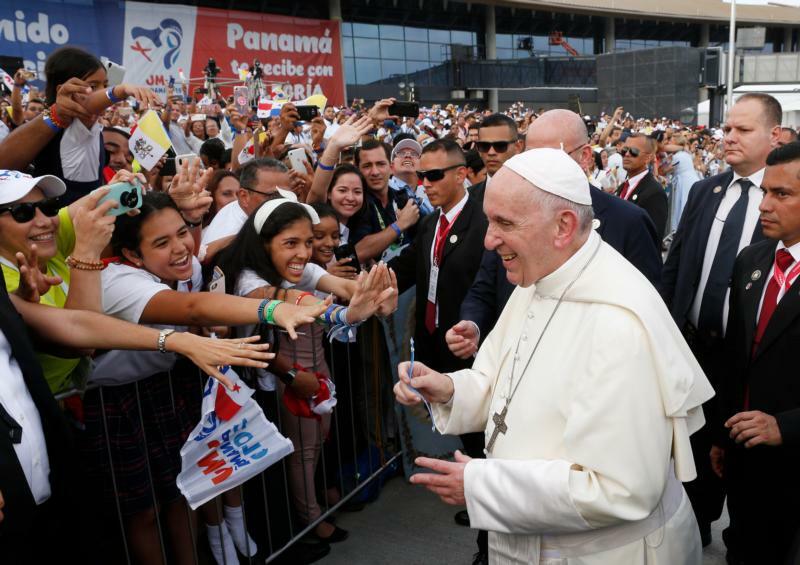 In a keynote talk that could have global relevance, Pope Francis on his second day in Panama called on the bishops of Central America to follow the example of St. Óscar Romero and “think with the church,” referring to St. Óscar Romero’s episcopal motto, inscribed on his tombstone. It “clearly expresses the principle that guided his life as a pastor,” Pope Francis said. “We have experienced this, and we continue to experience it in our own flesh through forgiveness and conversion,” the pope said. He reminded them, “Young people are the face of Christ for us, and we cannot reach Christ by descending from above, but by rising up from below,” as St. Óscar Romero made clear. He told the bishops that “thinking with the church means thinking with our faithful people, the suffering and hope-filled people of God.” He warned against “spiritual worldliness, which puts a religious and ‘pious’ veneer over the desire for power and influence, over vanity and even pride and arrogance. I saw the movie about Óscar Romero when I was a student. Raul Julia gave a very moving performance, especially the scene where he says I get down on my knees and beg you then rise up far above you and order you: Stop the Repression! St. Óscar Romero - Pray for us.